Generally, a celebration of Dashhara is deeply associated with Lord Ram and it is celebrated all over the country by one and all. The festival is mainly celebrated to commemorate Ram's victory over the demon Ravana. When Ram returns to his kingdom, There is Dipawali across the country. But Dashahara celebrated in Bastar in Chhattisgarh has a unique reason of its own. Bastar Dashahara has nothing to do with Ram's victory over Ravan. So there is no effigy of Ravan burnt here. The celebration continues here for 75 days (almost two months and a half.) followed unique rites and rituals. Let's talk about the reasons behind the celebration. As the records of historians go, here Maharaja Purshottam Dev came back to Bastar from Orissa (an adjacent state) with a lot of bounty having received divine permission from the presiding deity of Bastar Goddess Dantewshwari. Here, his returns are marked with the Celebration. He was given the title of "Rath Pati". Another uniqueness about the festivals is the way it is celebrated. As I said earlier it is celebrated for 75 days together so, there are a lot of rites and rituals one day after another. A log called "thuralu kholta" is worshipped. It is the first ritual being performed at the onset of Hareli Amavasya (by the end of the month of July). The festival is marked by pulling a huge chariot made of wood. Tribes perform various offerings before the log which was meant for the chariot. The sacrifice of Goat, fish are quite common along with other ingredients for worship. This ritual was held on 11 of September this year. To mark this occasion the large number of people including government officials (as a sponsoring body), chieftain, navigator and common people were present there. Wood plays a vital role in the lives of tribes here from birth to death. So they worship the log meant of making chariot. Priest Dalpati performing puja said, "four wheels of the chariot would be made out of it." Well, the log brought to make chariot is called 'thuralu khotla' It was used to make four wheels of Chariot. This is one of the major attraction to tourists visiting in Bastar. 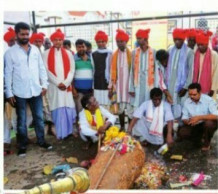 Deri Gadai - Installation of the pillar to start the festivals. Kachin Gadi -seeking permission to start the biggest festivals from the deity Kachin. Kalash sthapana -formal ceremony with Jogi's sitting in penance. Rath parikrama circulation of the chariot round the city. Maha Ashtami The Worship of deity Danteshwari and welcome of other deities to the site. Mai Bidai on Bidding farewell to goddess Danteshwari. 108 village chieftain along with 50 members, 76 navigators and other were present to witness the ritual called Paat Jaatra. This is just a birds eye view of the celebration . Dashahara in Bastar is a major attraction for domestic and international tourist. Very informative. Bastar is unique place to visit during the period.